Fish are cold blooded and require a temperature that is native to them. If a great temperature change happens that could stress the fish and spread sickness through the aquarium and they could get the disease ich. Click here to learn more about ich. The temperature of the water should NEVER change more than 3° per day. Freshwater aquariums should be between (73-82°F), but for most fish they do better at (75-79°F). More specific temperatures can be found on this site for each fish. When your choosing your heater for your aquarium it will be determined by the volume of water. Another factor of the temperature changes is the aquarium being placed near an air conditioner, near a heater, or how well the aquarium is covered. A good roll of thumb is 5 watts per gallon. If the aquarium is in a cool room or basement it should be doubled. You should also get a thermometer to accurately check the temperature. When you get a thermometer, look at all of the thermometers and check their temperature and get the one that has the same temperature as the rest of them. The most misunderstood about air pumps is the fish do not get their air from the air bubbles you see it is from the exchange of carbon dioxide and oxygen, which happens at the surface of the water. What actually is giving them air is from the water current. Here is a picture of a biological filter. The picture on the right is how the under gravel filter works. The left picture is a Power Head air pump. The Power Head is a good air pump that will help aerate the water better. When you purchase a air pump get the size that matches your aquarium, it will say on the box what size aquarium to use it for, don't get a air pump smaller than your aquarium needs or the fish won't get enough of air. It is suggested that when you use a air pump that you use a air way valve that will release extra air out of your air pump, greatly increasing your pumps life. 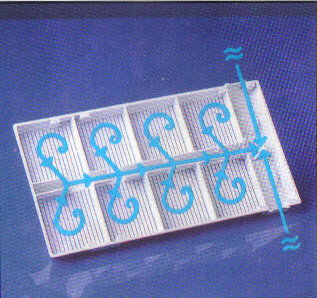 The filtration is one of the most important parts of the aquarium that keep your fish alive. Most of the wastes that fish produce like overfeeding, organic material like dead plant material and dead fish can only be removed by filtration. This type of filtration is where the waste is being pulled through and filtered through, and then the water that comes out is clean pure water. This doesn't remove all waste products like ammonia. This is almost the last stage of filtration. When the mechanical filter can't remove anymore of the waste let the bacteria clean the rest of the water same as in nature. There are two very important bacteria, which are nitrosomonas and nitrobacteria that use ammonia and nitrite as a food source. Without this bacteria the fish will literally poison themselves. A very well known filter is the under gravel filter, it helps the bacteria to get a good supply of food and it will enhance the biological filter. This is why most beginners are unsuccessful because they kill the bacteria, which kills the fish. This bacteria is very slow in its production so make sure your aquarium has plenty of air because they need air to survive. It takes ten days after the aquarium was set up for the bacteria to remove all the ammonia in the water and the bacteria turns it into energy plus nitrite which is also toxic to fish. 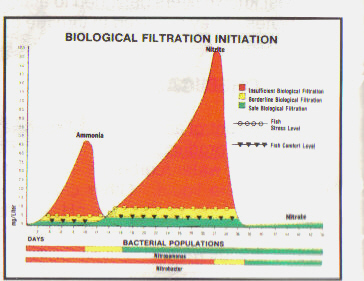 Here is an example of the chart for the biological filtration. Notice how the ammonia and nitrite both rise then drop dramatically. Ammonia is the first one then nitrite. When nitrosomonas has turned ammonia into nitrite, nitrobacteria will then absorb the nitrite through its cell wall and turn it into energy plus nitrate. So when you start a new tank the ammonia will build up to a high peak and then drop to zero in about ten days. Now at this point the nitrobacteria will begin to multiply and catch up to the nitrite. It takes almost 21 days for nitrobacteria to catch up to the nitrite. This period is called the "run-in" time from when you started your aquarium. So it takes almost 31 days for both bacteria to get rid of ammonia and nitrite. When nitrobacteria catches up to the nitrite it will turn it into nitrate. Nitrate is also toxic to fish but it has to be high levels. At this point the biological filter can't get rid of the nitrate so you have to get rid of it yourself. To get rid of nitrate you have to do partial water changes and you can use live plants because plants will absorb nitrate. Here is a picture of how the biological filter absorbs the ammonia, nitrite, and nitrate. This is the last stage of filtration. This type is a chemical that you add to the water to clean the water and help get rid of ammonia and nitrite. Another chemical you can add is a culture of the two beneficial bacteria's that will help clean the water.